Seven games remain in Morecambe’s League Two season with the Shrimps sitting 19th in the table ahead of Crawley Town’s visit tomorrow. Although Jim Bentley’s players were well beaten at Swindon Town last weekend, none of the teams below them could capitalise with three points. 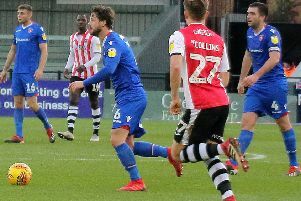 Cambridge United moved level with them thanks to a draw at Carlisle United, while second-bottom Macclesfield Town picked up a point against Stevenage. That moved the Silkmen to within eight points of Morecambe and with a game in hand prior to the two clubs meeting a week tomorrow. Watch as Bentley talks about the battle at the bottom of the table.